Tri-Village’s Maddie Downing (33) grabs a rebound in front of Miami East’s Whitley Gross (23) Tuesday night at Miami East High School. Tri-Village’s Meghan Downing (20) goes up for a rebound Tuesday night against Miami East. 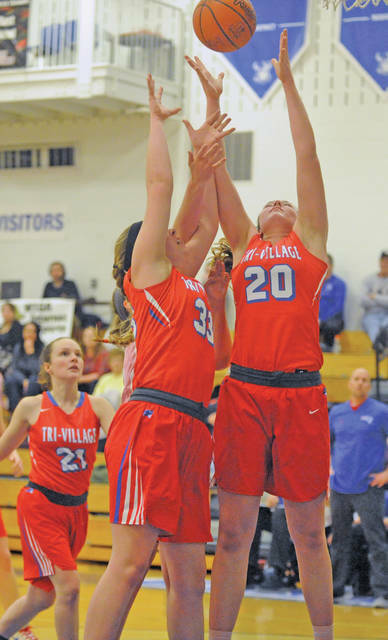 The Downings both posted double-doubles and Printz gave the Patriots three players in double figures scoring as Tri-Village (17-1, 10-0 CCC) showed why it is the No. 4 team in the state in the latest Division IV poll, beginning the game on a 13-0 run and never looking back. Meghan Downing led the Pats with 17 points and 22 rebounds, Maddie Downing added 16 points and 16 rebounds and Printz had 16 points as the Vikings were outrebounded 54-20 in total. The Viking comeback continued early in the third as Staton hit a jumper on an in-bounds play to cut the lead to five at 25-20, but that would be as close as East got. After a 3 by Haney cut the lead to 33-27, Tri-Village went on an 11-0 run, lobbing the ball in to the Downings consistently — and even getting a 3 from Meghan Downing — to take a 44-27 lead before a bucket by Haney made the score 44-29 after three. The lead in the fourth grew to as many as 20 at 59-39 late in the fourth before Haney scored the Vikings’ final five points of the game.